Actress and Model Sara Malakul Lane paired a dress by Morris Janks with heels from Alejandra G and a clutch by Nicoli while on the red carpet for AFM & The Exchange's five year anniversary celebration in Santa Monica, California on November 1st, 2016. The actress stars in the recently released film Kickboxer: Retaliation alongside Mike Tyson and Jean-Claude Van Damme. She is currently the spokesmodel for the high-end hair care line AQUIS Hair and recently was a featured model on Sports Illustrated's website. Sara Malakul Lane is a successful Thai model and actress. She began modeling at the age of 14, and has also been in a number of big screen movies including Scouts Guide to the Zombie Apocalypse (2015). The designer collaboration behind Morris Janks is 60 years in the industry. Following a First grade graduation from one of the worlds most renowned design schools, a stint working behind the scenes for some of the most influential designers globally, such as Rolland Mouret, Jenny Packham, and Jonathan Saunders has provided a depth of understanding and experience of the woman’s form, realizing comfort and beauty in each Morris Janks garment created. Concurrently, garnering knowledge and expertise, while working within the realms of a ‘turn-of-the-century’ leather house, a love affair with the medium was born. While a string of successful, International fashion brands are already under the belt, the collaboration brings an enviable and uncommon mix of expertise to the Morris Janks brand, resulting in original, unusual, yet breathtakingly beautiful garments. 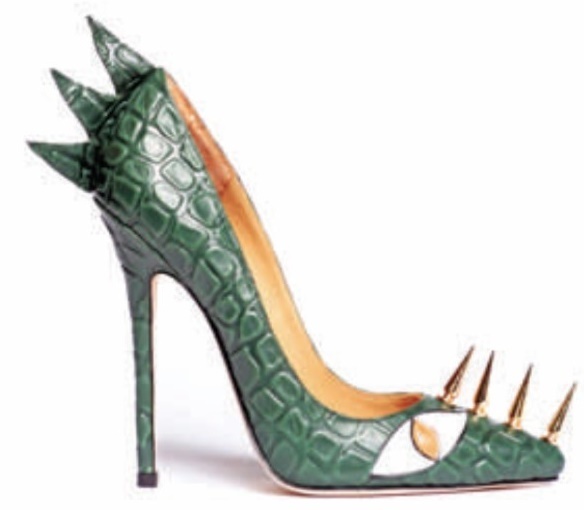 Since launching her first collection in Winter 2012, Alejandra G. has fascinated the fashion world with her brilliant mix of textures, colors and drop-deal glamour, which makes her shoes identifiable, exclusive and daring. Alejandra G. has brought her collections to life with hard work and genuine passion. Behind all of the exquisite designs is brilliance that must be appreciated. Composed of exotic printed leathers and eye-catching colors, Alejandra's collections are not only luxurious and innovative; they are inspired by the European trends she was exposed to while she attended school in Milan, Italy. Her shoes are must-haves for celebrities like Kylie Jenner, Cara Delevingne, Carrie Underwood, Gina Rodriquez, Tyra Banks, Giuliana Rancic, Adrienne Bailon, Jasmine Villegas, Christina Milian and Whitney Port. The NICOLI brand was founded in 2004 by Khurram Rafique and is proud to be an integral part of His Highness Sheikh Mohammad bin Rashid Al Maktoum's vision for the UAE to lead the world in the global luxury goods market. Already a significant brand with 7 high-concept stores flourishing within the GCC region, NICOLI's growth has been forged by innovative and trendsetting collections, building rock-solid foundations and maintaining excellent partnership links. NICOLI is a family business and a family of business partners as part of Al Jaroodi Traders Group, established in 1980, NICOLI remains a private enterprise allowing us to ensure complete control over both the quality of our products and their highly desirable designs.